A British war-time thriller with a difference, Eye of the Needle is played out as far removed from those war-torn battlefields as you could get. Instead, director Richard Marquand opts largely for more intimate surrounding and manages to squeeze out some memorable moments of Hitchcockian suspense and tension. On the strength of his self-assured work here, Marquand subsequently landed the directing gig on a little-seen feature called Return of the Jedi. 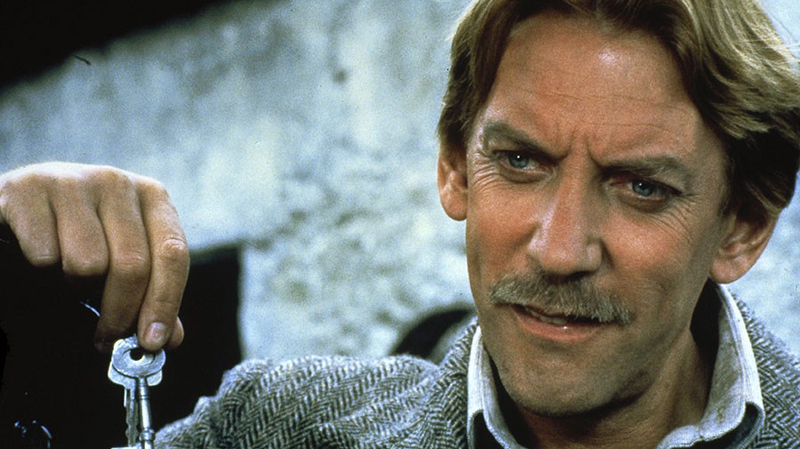 Donald Sutherland is Faber, a meek and affable British railway employee who is actually harbouring a dark secret. In reality, he is a German Nazi spy known as ‘The Needle’. Sending covert messages back to the home county, he chances upon sensitive information regarding the Allied invasion of Normandy. Having dispatched of his nosy landlady, he’s then pursued by British intelligence and forced to seek refuge on a remote Scotland island while he awaits his rendezvous with a German sub. On the island lives Lucy (Kate Nelligan), her paraplegic husband David (Christopher Cazenove), and their young son. Lucy is stuck in a loveless marriage with the embittered ex-army officer David, and she soon strikes up a physical relationship with Faber, completely unaware of the danger she is opening herself up to. Sutherland is on fine form here as the monstrous spy – a sociopathic, cold-eyed murderer who is still capable of melting the heart of the repressed Lucy. His efficient means of offing his victim by discreetly bludgeoning them with a concealed dagger – a chilling modus operandi from which his spy moniker has been derived – even tips the film into slasher territory. He is matched, performance-wise, by fellow Canadian Nelligan. Lucy’s abject horror upon realising whom she’s been sharing her bed with soon shifts into resilient battle mode, and the actress makes that switch with ease, particularly during the stormy denouement. With a strong through-line of suspense – from Faber’s treacherous activities in London, to the final siege-like action in a craggy wind-swept hilltop cottage – Marquand still manages to work in a satisfying and convincing love triangle, where unlikely romance beckons for the cold killer. That’s not to say the film doesn’t occasionally trip itself up with the admittedly preposterous premise. The scenes of Sutherland speaking in his native tongue – clearly overdubbed by an actual German-speaking actor – verge on parody, and some of the action staging feels a little antiquated and silly in a modern context. Overall, however, Eye of the Needle remains a largely solid and well-executed espionage genre offering. Remastered and impeccably presented by BFI’s home video label, while supplementary material on the actual film is a little sparse, included on the disc is a selection of intriguing short films from 1940, which were designed to warn cinemagoers at the time to be mindful of any enemy living amongst them. If only the film’s characters had actually been privy to these pro-war shorts.